Adherence and non-adherence are behaviors, and adherence to medication regimens requires behavior change. Motivation is a key factor in successful behavior change and has been shown to promote adherence to chronic therapies (World Health Organization, 2003). This appendix presents techniques that will be useful in assessing motivation and helping older adults increase their intrinsic motivation to adhere to medication regimens and other chronic therapies. Two models are introduced: Readiness to Change and Motivational Interviewing. These techniques and the concepts behind them are discussed primarily in the context of medication adherence, but they can also be applied to such lifestyle modifications as diet and exercise. Behavior change is rarely a discrete, single event. During the past decade, behavior change has come to be understood as a process of identifiable stages through which people pass (Zimmerman et al., 2000). 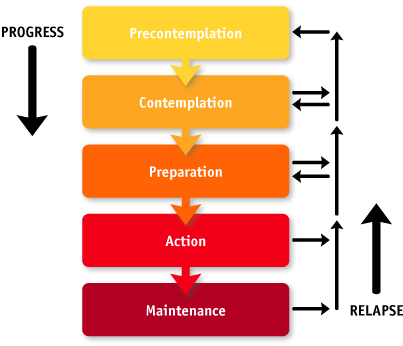 The Stages of Change model describes five stages of readiness (Figure 5) - precontemplation, contemplation, preparation, action, and maintenance - and provides a framework for understanding behavior change (DiClemente and Prochaska, 1998). For most people behavior change occurs gradually over time, with the person progressing from being uninterested, unaware, or unwilling to make a change (precontemplation), to considering a change (contemplation), to deciding and preparing to make a change (preparation). This is followed by definitive action, and attempts to maintain the new behavior over time (maintenance). People can progress in both directions in the stages of change. Most people will "recycle" through the stages of change several times before the change becomes fully established (Zimmerman et al., 2000). The Stages of Change model is useful for identifying appropriate interventions to foster positive behavior change (Table 6); by identifying where a person is in the change process, interventions can be tailored to the person's "readiness" to change (Zimmerman et al., 2000). Anything that moves a person along the continuum towards making a positive change should be viewed as a success. Once the person reaches the contemplation stage, additional strategies can be employed to help the person move along the stages of change. It is important to evaluate a person's readiness to change for any proposed intervention (Zimmerman et al., 2000). Interventions that are not staged to the readiness of the individual will be less likely to succeed. Also, interventions that try to move a person too quickly through the stages of change are more likely to create resistance that will impede behavior change. For example, if trying to get a person to quit smoking, it is essential to know where the person is in his or her readiness to stop. A person who is not even thinking about quitting smoking (precontemplation) is generally not ready to receive information about specific smoking cessation aids. In this case, focusing the intervention on smoking cessation aids sends the message that the health care provider is not really listening. This may not only damage rapport but can also make the person even more resistant to quitting smoking. A more stage-specific intervention with this person would be to try to get the person to think about quitting (contemplation). Once the person reaches the contemplation stages, additional strategies can be employed to continue to move the person through the stages of behavioral change. Anything that moves a person along the continuum toward making a positive change should be viewed as a success. Employing stage-specific interventions will decrease provider frustration by lessening the unrealistic expectation that change will occur with a single intervention. The person is not even considering changing. They may be "in denial" about their health problem, or not consider it serious. They may have tried unsuccessfully to change so many times that they have given up. The person is ambivalent about changing. During this stage, the person weighs benefits versus costs or barriers (e.g., time, expense, bother, fear). The person is prepared to experiment with small changes. The person takes definitive action to change behavior. The person strives to maintain the new behavior over the long term. A question that can be put to individuals to help evaluate their readiness to change can be as simple as: "Are you willing to take a medication to treat your condition?" Readiness to change can also be evaluated using a more quantitative scale: "How ready are you on a scale from 1 to 10 to initiate this therapy (medication, diet, exercises) to treat your condition?" Two major factors that have been found to affect a person's readiness to change are "importance" and "self efficacy". Importance is determined by what value a person places on making the change. Self efficacy is a person's belief or confidence in their ability to succeed at making the change. Depending on the health scenario, people may exhibit different levels of importance and self efficacy (Rollnick et al., 1999). A person who is overweight may be convinced of the importance of losing weight but have a low level of confidence based on previous failure to lose weight or keep weight off. A person who is newly diagnosed with hypertension may be confident that they can take a pill to lower blood pressure but are not convinced of the importance of this action. A deficiency in either importance or self efficacy can lead to a person's unwillingness to commit to change. The Readiness-to-Change Ruler is used to assess a person's willingness or readiness to change, determine where they are on the continuum between "not prepared to change" and "already changing", and promote identification and discussion of perceived barriers to change (See Readiness-to-Change in the Assessment Tools section). The Readiness-to-Change Ruler can be used as a quick assessment of a person's present motivational state relative to changing a specific behavior, and can serve as the basis for motivation-based interventions to elicit behavior change, such as motivational interviewing.